Cooking at Café D: The 2 Things you NEED TO KNOW Before Frying a Turkey! The 2 Things you NEED TO KNOW Before Frying a Turkey! BTW, there's still time to enter this week's Linky Party if you haven't had a chance. Many people swear that fried turkey is the most mouth-watering turkey they have ever eaten. I suspect that's because EVERY turkey they've EVER eaten has been cooked within an inch of its life - er, wait, makes shoe leather taste like tenderloin. Yeah, that's the analogy I'm going with. Here are 2 things you need to know. "Be sure your turkey's defrosted." "Be sure you consider displacement!" Or, worse - eating lime green jello! I'm embedding the links but if they stop working simply type Alton Brown Fried Turkey into You Tube. 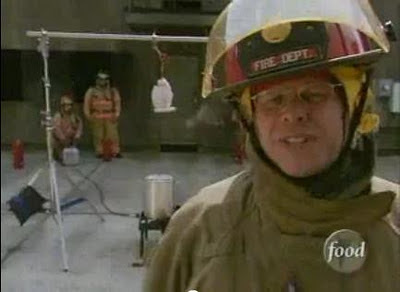 And, if you want to build your own "Turkey Derrick," as shown on Good Eats episode, Fry, Turkey Fry - just stop at Alton's site or click here. So what are the 2 things you need to know? Video Part 1 and Part 2, of course!